The negotiation process that has been going on for many years to end schism within the Ethiopian Orthodox Tewahdo Church (otherwise known as Ethiopian church) came to an end. 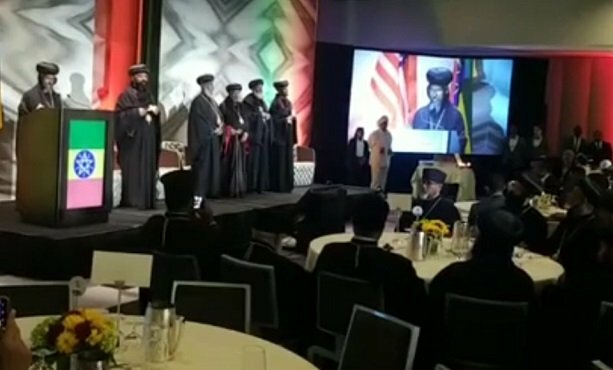 And members delegates from the patriarchate in Ethiopia and those based in the United States, in the last 26 years, officially declared reunification today from Water Gate Hotel in Washington DC in the presence of Ethiopia’s Prime Minister Abiy Ahmed who is credited with hastening the process. Abune Abraham, who is a bishop for Bahir Dar and member of the delegation from Ethiopia, read key points of agreement out that brought divided Ethiopian church together again. Abune Merkorios was the fourth Patriarch of Ethiopia but was compelled to leave behind his patriarchate in Addis Ababa due to political pressure from the ruling party, and the former prime minister Tamrat Layne gave his testimonial about it, and loyal members of the Holy Synod followed him to the United States to reorganize the patriarchate from exile which he has been leading for the last twenty-six years. According to the new agreement which ended the schism, Abune Merkorios is to return to Ethiopia as patriarch with all the spiritual honors and serve the Ethiopian church as a spiritual father emphasizing on leading prayers and blessing his laity. His residence is to be in the patriarch’s palace at Arat Kilo in the capital Addis Ababa. The sixth patriarch of the Ethiopian church, Abune Mathias, who has been in the seat since 2013 following the death of the fifth patriarch, Abune Paulos, is also to remain as a patriarch of the church focusing on administrative matters as per cannons of the church. Clearly, the situation is in violation of canons of the Holy Synod which states patriarch cannot be appointed while a patriarch is alive. However, the delegates reached a common understanding that the spiritual laws governing the Holy Synod has been violated since the time of the second patriarch, Abune Tewoflos, who was removed forcefully and was later killed by the revolutionary government of Colonel Mengistu Hailemariam. The names of the two patriarchs are to be cited during a mass in the Ethiopian church either in Ethiopia or abroad. A special welcome ceremony is to be organized to Abune Merkorios and a committee is formed in Ethiopia to carry out this function. The church is also to organize a unity conference in which it will celebrate the reunification and lift excommunications. Prime Minister Abiy Ahmed who was present at the ceremony expressed that he is elated with the result of the reconciliation effort. “We want the unity of Ethiopian Orthodox Tewahdo Church because the church is a country” added Prime Minister Abiy Ahmed. He also emphasized that the division within the church in the past 26 years has harmed Ethiopia. The reunification of the church, thinks Prime Minister Abiy Ahmed, could lay a foundation for peace in Ethiopia as well. At this point, it is known that there will be another event at the Millennium Hall in Addis Ababa to celebrate the achievement in terms of bringing peace within the Church. And there is unconfirmed information that Abune Merkorios might return to Ethiopia along with Prime Minister Abiy Ahmed sometime next week. One Response to "Ethiopian Church officially declared reunification in the presence of PM"
So two patriarchs who came to the patriarchy outside of canonical rules. Brought together by a secular government that has a pentagram for a logo on our flag. How is this an improvement if not a pathetic display of the desecration of our church and it’s values. Much remains to change for restoration to occur. The good news is, that time is at hand and we are all excited. This development we watch with just hmmmmmm.